Stan's Colorful Steed features SE 5a's of 40 Sq RAF in May of 1918. 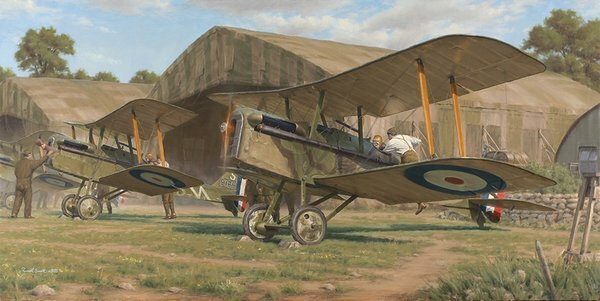 The scene depicts the SE 5a's as they are getting ready to pull the chocks for a sortie. The Se 5a in the foreground is that of Major Stan Dallas, the highest scoring Australian Ace of WWI. Dallas flew this SE 5a, D3511, late in the war. It bore a distinctive camouflage pattern which was not used on other SE 5a's. The actual tones used on D3511 are speculative at best. Those used here are based on the work of WWI aircraft profile artist Ronny Bar.